In the constantly changing world of online poker games, there are multiple surprises for those who seek. After all, such sites have been trying to attract new players to their realm ever since they were first founded. Plus, players keep up with such treatment, much to their enjoyment. 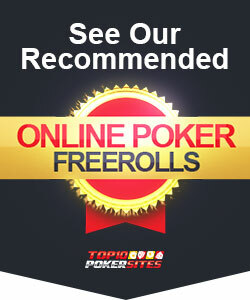 One specific offer found on multiple online poker rooms are poker freerolls. As a type of online poker game, it normally has its own terms and conditions which the player needs to agree with. Moreover, there are certain prerequisites which need to be met in order to become eligible for play. Is it possible to build a bankroll with poker freerolls? Do I need to play poker freerolls, or there are certain other offers? Poker freeroll has a set of characteristics which separate it from the remaining poker games. Namely, it is a poker tournament which does not require any entrance fees from its participants. However, despite the lack of financing, it provides them with real money prizes, usually ranging around a couple of hundreds, or real value gifts, like poker merchandize, or even better, tickets to bigger tournaments whose entry fees are usually costly. Yet, if you play your cards right, this simple poker freeroll opportunity might turn out quite profitable. This may appear strange to you, but poker sites have a tendency to employ this strategy even more than they do with certain bonus offers and promotions. Understandably, there needs to be a catch in everything, but when it comes to poker freeroll, it may vary. The point of these tournaments is the beauty of not paying any entrance fees and basically playing without spending a dime. At the same time, winning would get you a certain prize. Nonetheless, there are some conditions which need to be met. For one, there are some poker freerolls which accept players free of charge, but they take out a certain amount of their VIP player points. Hence, you would still need to play at the site and deposit some of your money in the first place in order to accumulate these points. Contrary to this, some poker freeroll tournaments are a bit more direct. This type usually requires the player to make a deposit on his player account at the respective poker site. This way, you don’t actually spend it, but once the money is on your account, you are more likely to play with it than withdraw it once again. On a lighter note, there are some freerolls whose demands are quite small, so much so that they appear insignificant. Namely, belonging to a certain geographical region or simply liking the page of some famous person from the poker world could get you a seat. The poker freeroll tournaments organized by poker rooms are significantly different than free poker sites. On first preview, there’s one main trait which might confuse you. After all, neither the poker freerolls nor the free poker sites require actual cash deposits in order to play them. However, poker freerolls are still offered on regular poker rooms which otherwise do demand deposits for their regular tables and games. The free poker sites don’t require any of that. Furthermore, there is another crucial distinction – the prize. Despite the fact players don’t have to pay any fees for these games, there are money or value prizes. Nonetheless, such prizes are limited to these freeroll tournaments players, while free poker sites ask for nothing, but also give nothing. The fact that you are entered and playing at the certain poker table without giving any money from your pockets, especially not at the actual moment of playing, can often go to your head. Many players tend to relax due to the lack of actual financial risk, making moves they wouldn’t normally make just to see what happens. But, there are still a couple of mistakes which might end the fun short, and reduce your chances of winning. Keep these tips in mind and get to that final table. Don’t wreck yourself – Even if you’ve managed to enter the tournament without any fees, it still offers a rewarding finale. As most people tend to lose their focus and go rampant, the best thing to do is wait on them to spend their free money. You should be able to play in a clearer environment in no time. Keep a record – One of the most professional and useful habits of poker players, and gamblers in general, is writing down their previous gambling exploits. Nevertheless, when speaking about freeroll tournaments, it’s enough if you know how to find the respective poker room. Believe that profits are possible – Setting up a bankroll shouldn’t solely comprise of your hard-earned money or saved cash. On the long run, the purpose of poker is to bet as little as possible in order to win as much as legally allowed. Use your free money and entrance privileges and increase your balance. Many people have always been interested about this offer, but without using the contact center support, all you’re left with are questions. Find the answers to some of the most popular once, with the click of a button. Yes, of course it is, as mentioned previously. After all, there are some private freerolls where the players seem to be of a more reasonable range. Playing with selected opponents influences the chances of profit as much as your own player influence. Of course you can’t be forced to play poker freeroll tournaments if you don’t feel like it. Other players might be more interested in paying for their poker games, but still want all the free stuff they can have. Therefore, such players would usually follow “the standard protocol”, using a simple bonus code or fixed promotion. Online poker rooms offer all the varieties you can think of, leaving their players to choose their medicine.